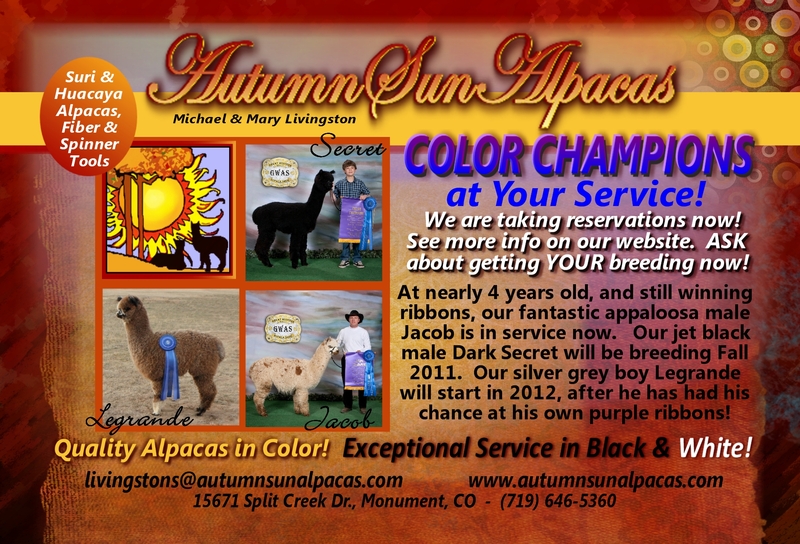 Autumn Sun Alpacas: Herdsire Herald! 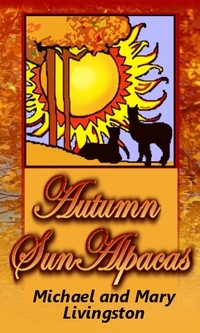 Home Autumn Sun Alpacas: Herdsire Herald! Our Alpacas Surf the Web! We Have Donated a Full Breeding to the 2013 GWAS in May! 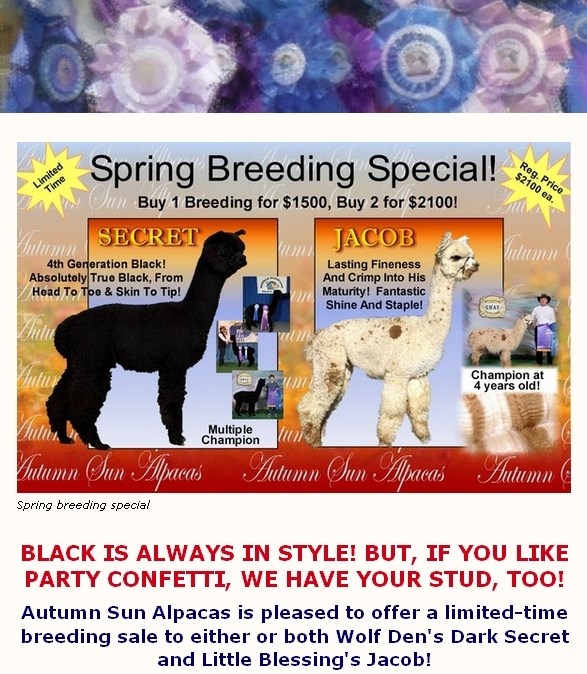 This online breeding will be hosted by AlpacaStreet so you can bid from the comfort of your home! This is for a full breeding to include 90 days free agisting, the ultrasound to confirm your cria, and your dam's transport exam and CVI to return home! Bidding starts 8:00 a.m. MST on May 1st and ends 8:00 p.m. MST on May 6th. Check out SECRET's webpage and then go to the auction listing to BID! 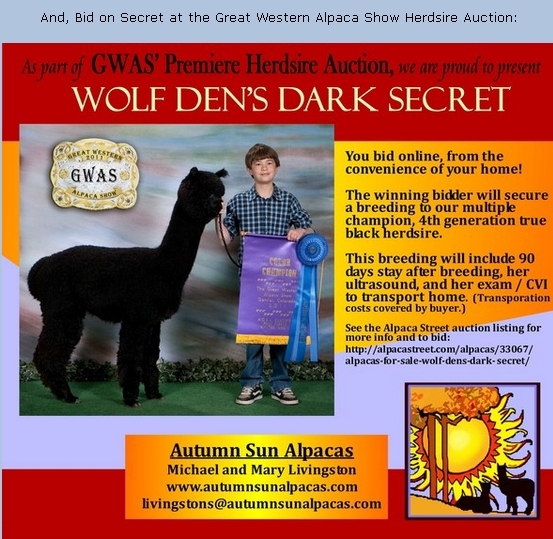 The proceeds will benefit the Alpaca Breeders of the Rockies, the fantastic organization that puts on the Level 5 Great Western Alpaca Show each year and has hosted the AOBA National Show twice in three years! Until the end of April, we are having a special on breedings to our two big boys: Secret and Jacob. Buy one breeding at $1500 or two for $2100 to either of them! That is up to 50% off! These breedings are reserved now but can be used next year if you have already made your 2013 breeding decisions! Take a look at these males to see why you want to add their genetics to your herd! Secret was chosen as one of the four special herdsires available in the select breeding auction at the 2013 TXOLAN Spectacular Show! We will be bringing this premier herdsire to the event to be viewed in person. Don't forget to stop by the farm stalls to see him! 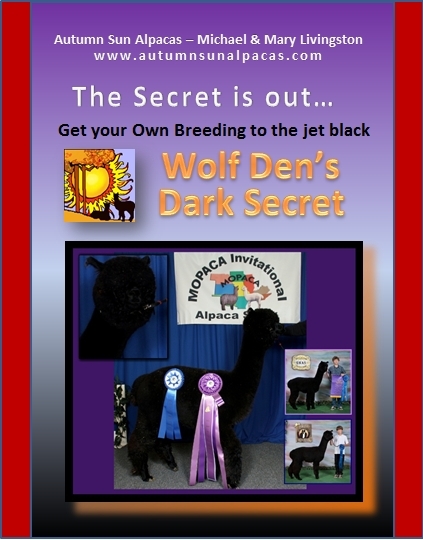 We will be entering our Dark Secret in the (April) A-OK Blastoff's Herdsire showcase (Friday night Meet & Greet) for a limited discount special. If breedings are reserved at the Showcase, we will include ultrasound and transporation exam / CVI for your female after a 60 day stay at our farm!